Synopsis: With Neil Armstrong as the focus, the years leading up to the first moon landing are depicted. 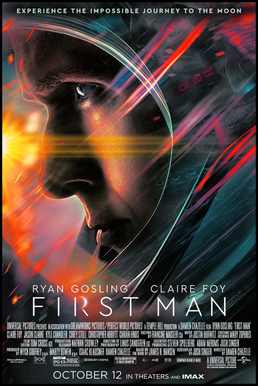 • Ryan Gosling’s quiet charisma as the enigmatic Neil Armstrong (1930-2012) powered the film. • Claire Foy’s performance as Janet Armstrong (1934-2018) provided a strong counter to the quiet duty of Armstrong. • Provided perhaps one of the most heartfelt films about events that changed the world. • Successfully showed the human side of otherwise awesomely insane yet beyond heroic acts, especially of those lost in the process. • The very human depiction of the Space Race might not have been what some wanted to see, some having very hardened views on the topic. • As is always the case with narrative history, the viewer is often left wondering what elements were altered to better fit the artistic goals and point of view. Few heroes are who we want them to be. It seems unlikely Neil Armstrong saw himself as anything more than a man doing something truly important and unique. Yet, heroes are perhaps more human than all of us, whether they come to embrace that or not, because they did something even they might not have thought was possible. We knew the flag Armstrong flew by, as we can see the moon landings on YouTube today. It was a moment not only forever enshrined on human memory, but also proof we can succeed at the most wild of aspirations. The best of humanity was what was depicted here and the genuine patriotism it fueled.